Your magpie instincts will kick in at the sight of these lovely bracelets! Crafted out of precious metals, embellished with colorful crystals and polished by hand, they are the finest wrist accessories on all of Etsy. Regardless if you’re looking for something to spice up an evening look or simply to accessorize a casual, everyday ensemble, here you’ll find the dreamiest bracelets. DeaDiaJewelry by Jessica Lawson is an Etsy shop offering modern handcrafted jewelry. The pieces in the shop are inspired by new beginnings and by the natural world. Their polished shapes and surprising contours create a sublime contrast against the stones which embellish them. Our favorite is this show-stopping piece. Available with either a circle- or a diamond-shaped top, it’s the perfect choice if you love making a statement with your accessories. This raw crystal cuff is a one-of-a-kind design that simply needs to find its way into your jewelry box. Plus, it’s hand made with love. Click above to purchase! Tzunuum is a label with a heart deeply rooted in nature. Every piece in this shop is created by hand, using locally sourced, recycled and even vintage materials. The resulting designs will leave you in awe – visiting the full shop is a must! But before you click over, take a moment to admire this glamorous cuff, with a geometric cutout pattern. A large aventurine stone sits right in the middle, held in place by sterling silver claws. This stunning bracelet is best observed from multiple angles in order to fully grasp its charm. Click over to see! Kalypso’s handmade silver jewelry is an unmissable shop in Etsy land. Stocking incredible pieces of jewelry, from bracelets to rings and earrings, this is the sort of online place that can get you hooked for hours. Each design is even more arresting than the one after it – in short, it’s a jewelry lover’s paradise! 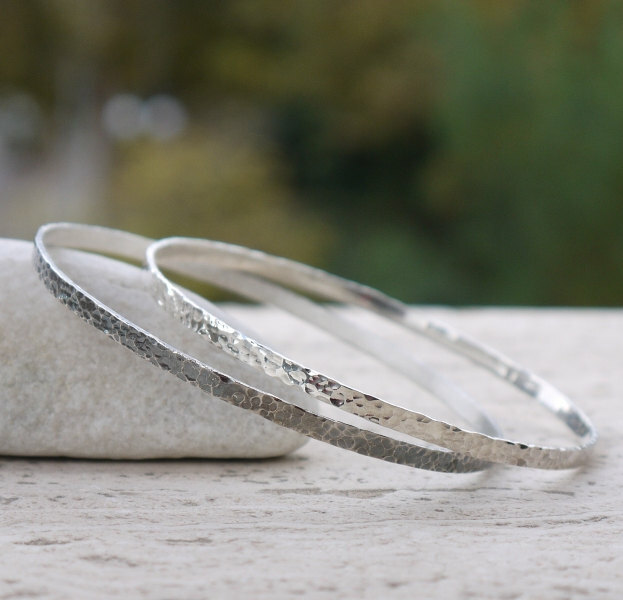 So let’s start with some basics in the shape of 2 hammered silver bangles. Simple enough to wear on an everyday basis, yet sophisticated enough not to blend in, these could easily become your go-to bracelets. If you look closely, you’ll notice that one is polished to a slick shinny look, while the other is oxidized. The result? A dynamic contrast that’ll keep admirers guessing. Follow the link above to purchase! There’s nothing quite like a fabulous stack of thin bracelets to get you out of any accessorizing dilemma! Handmade in Montreal, the Si Simple jewelry channels simplicity, without leaving aside the ideals of purity and finesse. And doesn’t it show! Each of the timeless designs in the shop illustrates this mantra. One of the top picks? An attractive stack of 4 bracelets which look so good worn together! You can get this bundle as is, but you can also purchase all the pieces separately, in case you want to personalize your selection. Simply click over to shop this stack or start mix and matching listings to make your own! NaturalGlam specializes in naturally glamorous, bohemian jewelry. Featuring raw crystal in various shapes and colors alongside gemstones and minerals, the NaturalGlam designs are hand crafted for the modern goddess. Just look at this candy-like bracelet! Raw crystal quartz in yummy pastel shades sit atop brass cuffs and are accented with silvery grains of pyrite. Wear this uber chic bracelet on its own or combine it with similar designs to highlight your personal style. Click over to choose your favorite hue!